2004 Dodge Viper SRT10- Local 1-Owner, Clean Carfax History, 2714 Miles. You Are Looking at One Of the Most Preserved Unmolested Viper Specimens In the Entire World. This Car Was Delivered New By Our Local Dodge Dealer To A Very Meticulous Owner That Pampered the Car for the Last 15 Years, Always Kept in Temperature Controlled Garage on a Trickle Charger and Covered. This Car Has Never Seen Rain or Inclement Weather. I have Personally Inspected This Car to Be 100% Original and Flawless Down to the Tires. I Have All Books, Keys, Cover and Charger. This Would Make a Great Addition to Your Collection and the Value Will Only Get Stronger.... 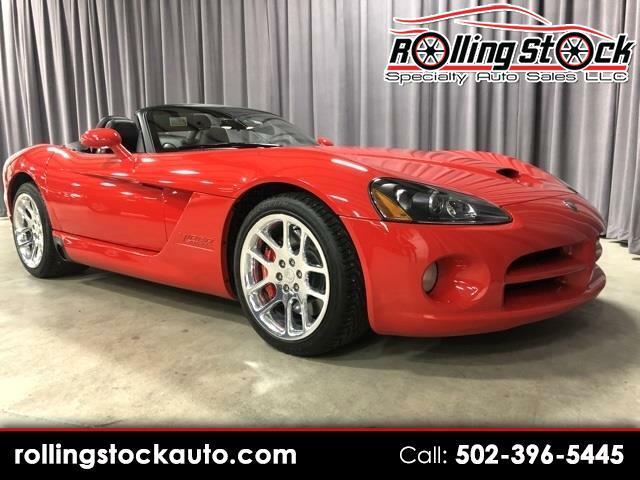 Contact Cary Donovan 502-396-5445 For Any Additional Questions or to Schedule a Personalized Appointment to View this Awesome Viper at My Louisville Indoor Showroom.